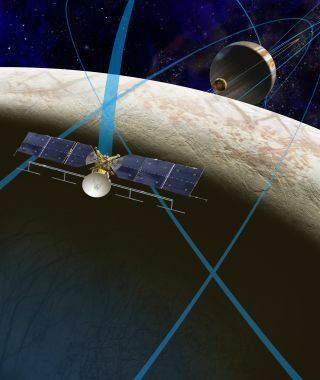 Artist's illustration of NASA’s Europa Clipper spacecraft, which will perform multiple flybys of the ocean-harboring Jupiter moon. NASA's upcoming mission to Jupiter's ocean-harboring moon Europa finally has an official name, and it's the one we've been calling it all along. The $2 billion mission — which will launch in the 2020s to assess Europa's potential to host life — is called Europa Clipper, which has long been its informal moniker, NASA officials announced Thursday (March 9). The name is a nod to the fast, three-masted sailing vessels known as clippers, which delivered a variety of goods around the world in the 19th century, NASA officials said. "In the grand tradition of these classic ships, the Europa Clipper spacecraft would sail past Europa at a rapid cadence, as frequently as every two weeks, providing many opportunities to investigate the moon up close," they wrote in a statement Thursday. "The prime mission plan includes 40 to 45 flybys, during which the spacecraft would image the moon's icy surface at high resolution and investigate its composition and the structure of its interior and icy shell." Astrobiologists regard the 1,900-mile-wide (3,100 kilometers) Europa, along with the Saturn satellite Enceladus, as one of the solar system's best bets to host extraterrestrial life. Both moons harbor oceans of liquid water beneath their icy shells. And both of these oceans are thought to be in contact with the rocky mantle below, making possible a lot of interesting chemical reactions, researchers have said. The solar-powered Europa Clipper probe will set up shop in Jupiter orbit. During the Europa flybys, the spacecraft will use a variety of instruments to study the moon's ice shell and ocean, with the overall aim of assessing Europa's ability to support life as we know it. In late 2015, Congress ordered NASA to develop a surface component for the Europa mission as well. The space agency is now studying the best ways to do that. The current vision calls for a stationary lander that would launch separately from the Clipper probe. Once it reached Europa, the lander would use three science instruments to search for signs of life in the ice just beneath the surface.